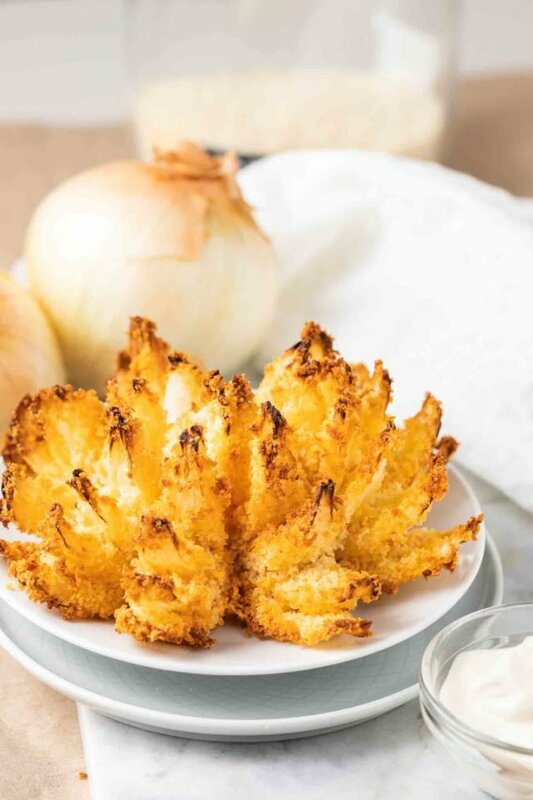 This Air Fryer Blooming Onion tastes so flavourful and is healthier than the deep-fried version from Outback. Air fried until golden and crispy this easy baked appetizer recipe will be a hit at game days and parties. The Air Fryer is perfect for making your favourite party snacks healthier like our Air Fryer Chicken Wings, Air Fryer Onion Rings, and Air Fryer Fried Pickles. Making a Blooming Onion at home is a bit messy but well worth the effort. 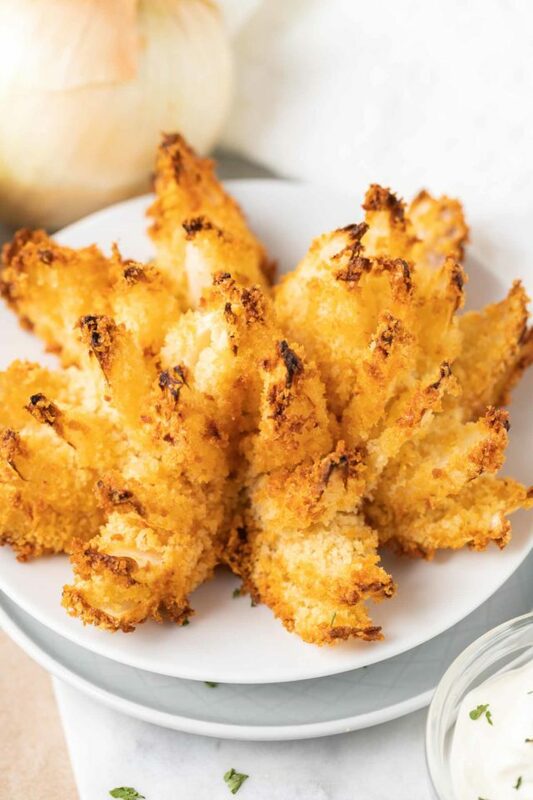 My Air Fryer Bloomin Onion has crispy golden petals and tastes so delcious and flavorful. 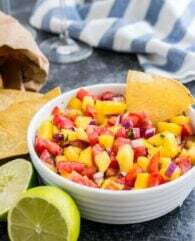 This is a fun dish to serve for a get-together because everyone loves it. Serve the crispy petals with a homemade dipping sauce! The Air Fryer saves you a lot of calories compared to deep frying and food will taste crunchier and better than baked in the oven. 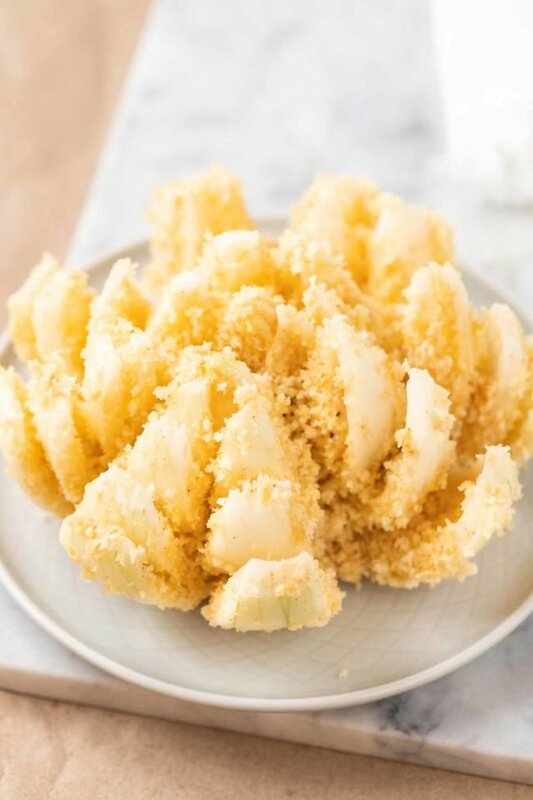 The famous Bloomin Onion from the popular Steakhouse Chain is made in the deep fryer and contains approximately 1954 calories and 134 grams of fat, making it in the Air Fryer brings the calories down to 840 calories and 36 grams of fat. Mix flour and spices in a bowl. Combine buttermilk and egg in a bowl. Add half of the flour mixture to the buttermilk mixture. Combine panko breadcrumbs and spices in another bowl. Fully coat onion with flour mixture. Shake off excess flour. Pour batter over onion with a spoon until evenly coated between the petals. Place onion in panko breadcrumbs and fully coat with the mixture. Shake off excess. Place in Air Fryer and fry until cooked through and golden. Use a sweet onion, a normal onion will taste too strong. The onion should have room temperature so it cooks more evenly. Make as many cuts as possible, the smaller the petals the better it will cook through. 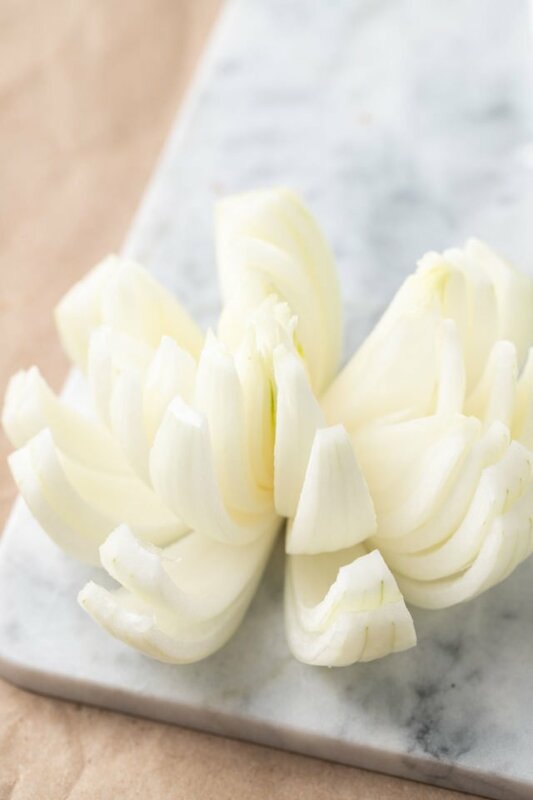 Put the cut onion in a bowl with ice water for a few minutes, it will blossom out even more! When the time is up test if the petals are cooked to your liking. If they aren’t then cook the onion for a few more minutes. What kind of Onion is best for a Blooming Onion? 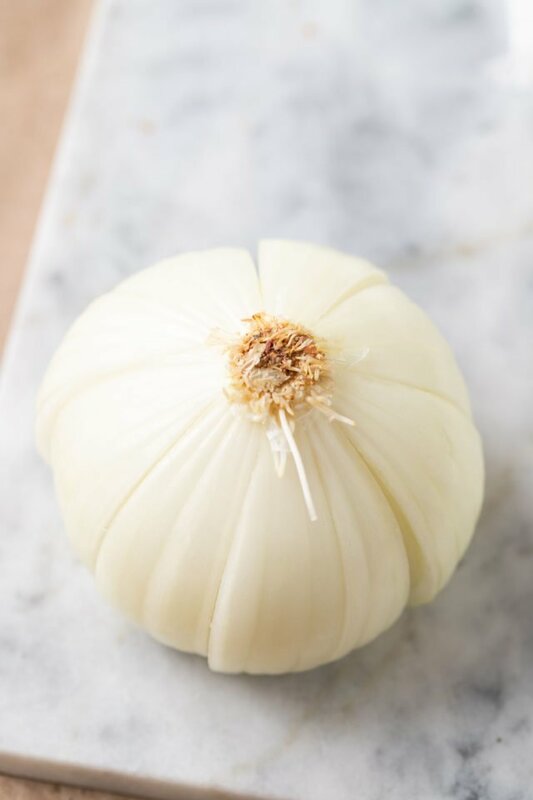 If you don’t have a sweet onion on hand you can use a yellow onion. These are generally a bit sweet but will taste stronger. A red onion might also work because they are milder than yellow onions. Cut off the tip of the onion and peel it. Flip it cut side down on a cutting board and start slicing 1/4 inch away from the root. The root should stay attached. Make as many cuts as possible, start with 4 quarter slices and then slice each quarter 3 to 4 times to get similarly sized petals. How many cuts you can make depends on the size of the onion. Flip the onion back over and carefully spread out the petals. A great way to make them spread out more is to put the sliced onion in ice water for a few minutes. 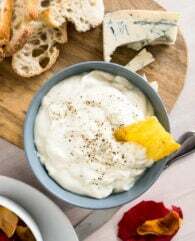 Mix together 1/2 cup mayonnaise, 2 tablespoons ketchup, 2 tablespoons creamed horseradish, and 1/4 teaspoon paprika. Want to try this Air Fryer Recipe? PIN IT TO YOUR AIR FRYER BOARD TO SAVE IT OR SHARE ON FACEBOOK! 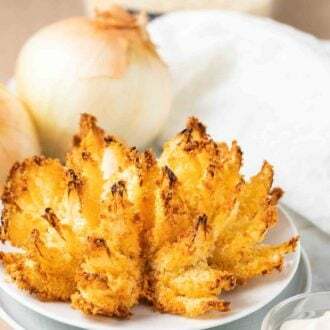 This Air Fryer Blooming Onion tastes so flavourful and is healthier than the deep-fried version from Outback Steakhouse. Cut off the tip of the onion and peel it. Flip it cut side down on a cutting board and start slicing 1/4 inch away from the root. The root should stay attached. Make as many cuts as possible, start with 4 quarter slices and then slice each quarter 3 to 4 times to get similarly sized petals. Set aside. In a shallow bowl, combine flour, paprika, and ½ tsp salt. In another shallow bowl combine buttermilk (or milk and vinegar/lemon juice) and the egg, then add ¼ cup of the flour mixture from the first bowl and whisk until smooth. In a third bowl combine panko breadcrumbs, remaining salt, and olive oil with a fork until the oil is evenly distributed. Dredge the onion in the flour mixture and make sure it is coated evenly between the petals. Sifting the flour over the onion helps. Shake off excess flour. Dip the onion in the buttermilk batter and use a spoon or your fingers to coat it evenly. Place onion in the panko mixture and use your hands or a spoon to get the mixture between the petals. Place onion in the Air Fryer basket, spray it with oil spray and cover the top with aluminum foil. The air should still be able to circulate around the onion. Cook at 375°F for 15-20 minutes then remove the foil and air fry until golden brown and crispy, about 3-7 more minutes. Carefully remove onion and serve with dipping sauce.